Maine Lobster: Come and get it! The guests at our Freeport Maine Bed & Breakfast routinely ask where to go for Maine Lobster. While pretty much all the Freeport restaurants serve lobster (in one form or another, from a full lobster dinner to various baked lobster, lobster bisque or lobster stew), if you’re looking for the “real” Maine experience, you’ll want to visit a Maine lobster shack. Some time ago we took the “10 Best Lobster Shacks in Maine” article from Travel + Leisure magazine and mapped them, then added a few of our favorites that the magazine had missed, to create the map at the link above (also embedded below). That remains a hugely popular map, to help find the lobster shack you’d like to visit. Here are some comments on some that are not far from Brewster House Bed & Breakfast. Freeport’s own lobster shack is located in South Freeport, just a mile or two from Brewster House and Freeport’s shopping area. They offer a full, select your own, lobster dinner, as well as other local seafood. Sit inside, or at a picnic table on the wharf, and admire Wolfes Neck across the water, as the boats bob alongside. Just south of Portland, adjacent to Cape Elizabeth Lighthouse (Two Lights), on a small hill is Two Lights Lobster Shack. It offers lobster and other local seafood, as well as breathtaking views of Cape Elizabeth Lighthouse, Casco Bay, and on a clear day, Portland Head Lighthouse and nearby islands. Located at the tip of Georgetown Island, offshore from Bath, Maine, and about 30 minutes drive from Brewster House, the views offered at this working lobster dock are spectacular! 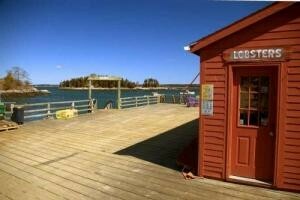 Eat on the dock in open air, and watch the lobster boats unload their catch nearby. Don’t forget to stop at Reid State Park for magnificent views of the sandy beach from the rocky heights around it. No comment on lobster shacks would be complete without mentioning world renowned Red’s Eats in Wiscasset. About 35 minutes north of Brewster House on US-1, Red’s is on the left side of the road, right in town, just before you cross the bridge to the north. Location is everything, and this location is part of the reason for the popularity of this Maine icon. Lines can be long in summer, as you wait for your top-rated lobster roll.